*I spent the morning working on items for my VIPKID contract and documentation. I needed to have a professional photo and two casual photos uploaded. I also needed to make an introductory video. With the help of Molly, Zoe and Cosette, I was able to get all three accomplished and uploaded to the VIPKID teacher portal. *Our “painting crew” worked very hard all day on the outside of our house. Our former yellow siding is now transforming into Chimney Smoke. The green trim is now getting painted with Boisterous Blue. The external red doors will now be painted a different shade of red called Romantic Attachment. (I think it would be fun to be the namer of colors for a paint company.) By the end of the day, all the yellow siding was covered except one section outside our bedroom windows behind the bathtub of roses. Cosette and Zoe worked hard painting the trim around some of the windows. Paul applied the first coat in most places with help from Jason. Travis and Taylor did touch up work in places with a second coat. Travis also meticulously put blue tape around windows as prep work for that job. Molly did get a few brush strokes in as well. I am the only one who hasn’t painted yet. I will at least be in charge of painting red on the front door. Once it is finished, I will post photos to show the transformation of our house. It was nice when Pat Elfsten, the owner of Furniture Exchange, the local hardware store where we purchased the paint, gave it his seal of approval!! *At the end of the day, we all drove over to Christy and Everett’s house for a family dinner/birthday celebration. A taco bar was set up at Bill and Debbie’s house. We fixed our plates on their deck, then ate at the tables set up in Christy and Everett’s backyard. Jane brought some delicious ice cream, with a variety of toppings to add to the ice cream, such as Salted Caramel Bailey’s, Kahlua and Huckleberry Liqueur. She also had fresh raspberries from her garden, and some bing cherries. Topping off these delightful flavors was some grated dark chocolate and a balsamic vinegar reduction syrup. All the flavors were delicious!!! *Christy gave me a new metal sunflower (one of my favorite flowers) to add to my garden. It was a perfect addition. Jane gifted me with our Costco membership. We also celebrated Zoe’s birthday, and Christy gave her a really cool nature journal. My new metal sunflower displayed in one of Christy's gardens. 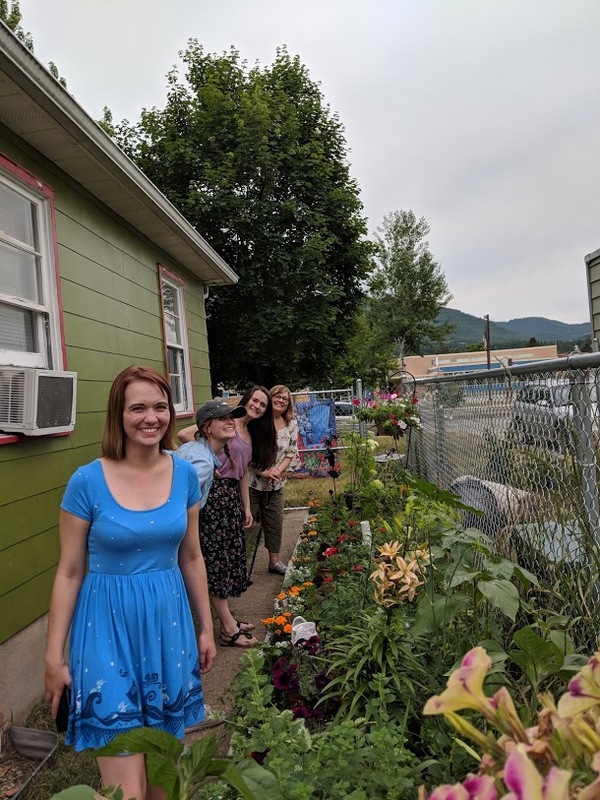 *During the evening, Molly, Cosette and Zoe were given a tour by their Aunt Christy of the “Mom Garden” that Christy planted in memory of our mom. It was nice to see Christy walking around her yard so well with the aide of her cane. She keeps receiving glowing reports from her Physical Therapist about how well she is doing in her recovery from her knee replacement surgery. *After a wonderful evening with family and friends, the Roberts’ clan went back to our house. I spent some time outside tending to my roses, doing some deadheading of flowers, and checking on the progress of the vegetables and flowers. The only plants I am disappointed with in my garden are the cucumbers. They are not looking good at all.